This recipe has probably deviated quite a bit over the years, since I just wing it every time I make it now. I was encouraged by Silvia’s own adventuresome spirit – she made this sauce without finishing it with heavy cream, as is traditional. She said it simply “wasn’t necessary” and I think she was spot on. 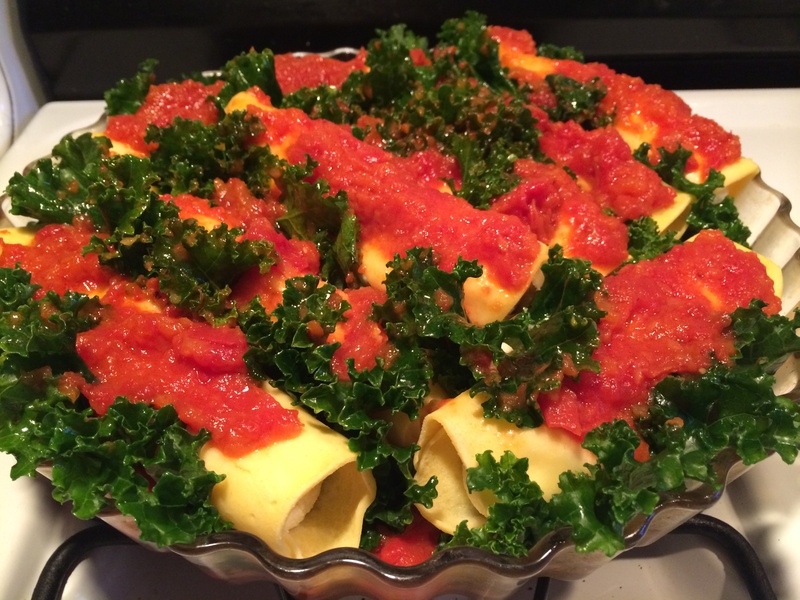 I have never had a better Vodka sauce, and it’s easily made vegan. It is a nostalgic recipe for me, full of old times and dear friends. It is a sauce full of love and memories. And recently I had the absolute pleasure of making it for my dad’s older brother, my Uncle Warren – an avid pasta fan who’s total delight in every bite made the recipe even sweeter. This one’s for you Uncle Warren! In a blender, puree onions, water and first 1/4 cup vodka until smooth. Set aside. In a large, heavy skillet, melt butter and olive oil over medium heat. Add a pinch or two of red chile flakes and fry for a split second before pouring onion puree into the pan. Add salt and mix well to combine. Cook over medium heat for 10- 12 minutes, stirring occasionally, until all the water is evaporated and onion puree is mild and sweet. Do not brown. When the onions start to noticeably fry (listen to them!) after 7- 8 minutes and look like a paste,- then add a splash of water (2 T), stir to deglaze the pan, and let cook down some more. Hover, stir, let cook, taste, add water, let cook, hover, stir…I do this 3 – 4 times, depending on the sharpness of the onions. Be attentive and do not skimp on this step – the flavor and sweetness of the onions carries the whole sauce. It will take about 10 – 20 minutes. 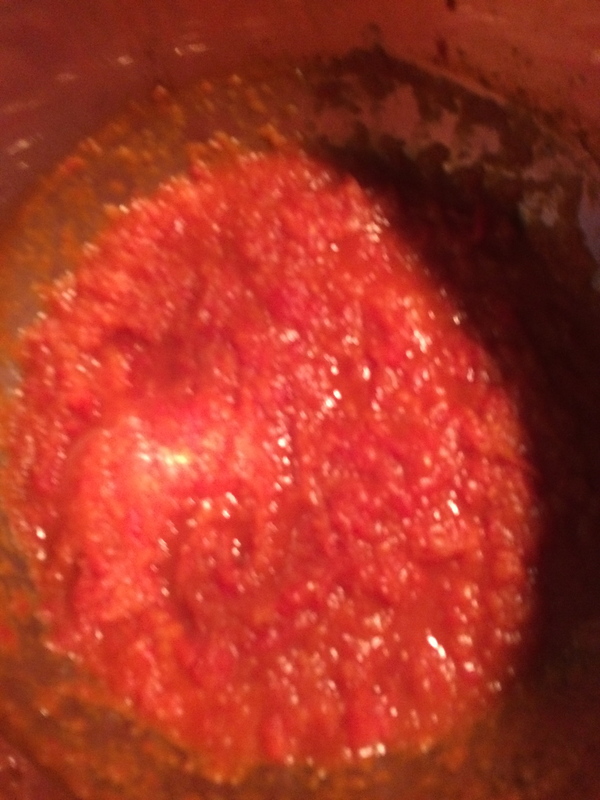 When all the water is cooked out and the onion paste is very sweet and has lost it’s bite, it is time to add the tomatoes: do this by reaching into the can with one hand and grabbing handfuls of diced or whole tomatoes and crushing them BY HAND, squishing them though your fingers into the bubbling onions. (Don’t ask me why this makes it taste good, but it does). Hold back on adding in the juice until all the tomatoes are in the sauce: saute the tomato pulp for a minute, then add in juice from the can. Stir and cook over medium-high heat for about 4-5 minutes – this part goes quick. 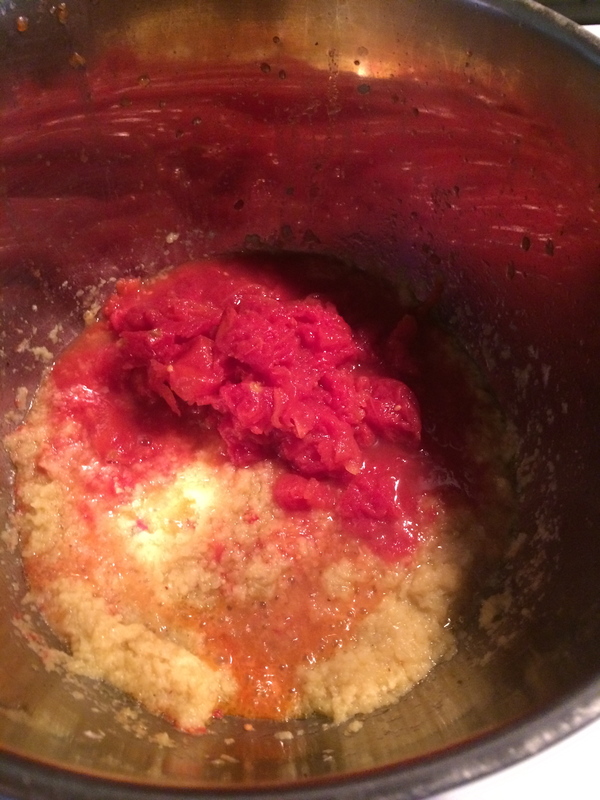 Taste and adjust for salt (you can use 1/4 – 1/2 t more here) If you are using good tomatoes, the sauce should be sweet enough, but add 1/2 t of maple syrup or coconut sugar if there is any hint of acidity left at this stage. Turn off heat and add remaining 1/4 c vodka to pan. Stir well. The idea here is that MOST of the alcohol in the vodka will burn off with the heat of the sauce, but some of it will sneak into your tomato chunks and just make them indescribably yummy. Do not simmer this sauce to keep it warm – if you need to wait on the pasta, keep the sauce off the flame until the very last minute, then heat briefly just before serving. Somewhere around the time you start to cook the onions, get your pasta water going. Bring water to a rolling boil in a large pot and SALT IT WELL – it should be briny like the ocean. Please do this. It sounds simple and I know we American’s get fed all sorts of anti-salt propaganda, but trust me – well-salted water is the secret to great pasta. And great pasta is good for the soul. Cook pasta al dente and drain immediately, return to pot and add a splash of olive oil to it. Toss in the pot to coat pasta in olive oil. If you salted the pasta water well, the pasta should be good enough to eat at this stage without any sauce at all. Add sauce. 🙂 Toss briefly, adding grated Parmesan if using. Serve immediately with extra Parmesan on the side. Buon Appetito! *A Note on Pasta: I have recently been experimenting with gluten free pastas, and have found that the Tinkyada brown rice pastas are great. Feeding a regular crowd? Don’t tell anyone… they will never know.